Keenso -- 7 Inch Round Mounting Bracket Ring Mount Brackets for Harley Davidson Jeep Wrangler JK 2007-2016 Help to fix LED headlight firmly (please place a proper position, modify big & small screws to made the headlight & mount firmly) Specifications: Condition: 100% Brand New Material: Aluminum alloy Color: Black, Silver(Optional) Dimention: 21.2 X 18 X 6cm /8.3 X 7.1 X 2.4in Weight: Approx. 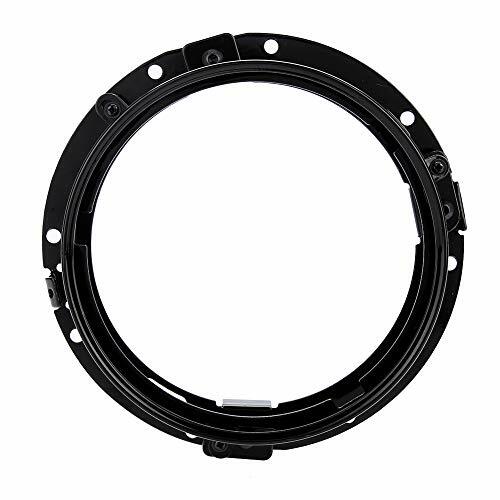 588g Fitment: For Jeep Wrangler JK 2007-2016 with 7" headlight Universal Fit for Harley Davidson models with 7" headlight,such as Harley Davidson FLD 2012-2013 Harley Davidson Touring Models 1994-2013Harley Davidson Softail Models 1991-2013(with head lamp nacelle kit) Package Includes: 1 x 7" Headlight Fork Mounting Brackets Notes: 1. Easy to install, but professional installation is highly recommended. 2. Minor drilling may be required for some models. Please verify that this part fits your vehicle before you purchase. Feature: - 1. Three hole style. - 2. Fully adjustable to fit 30-38mm diameter fork tubes. - 3. Nice quality, sturdy & simple styled mounts. - 4. 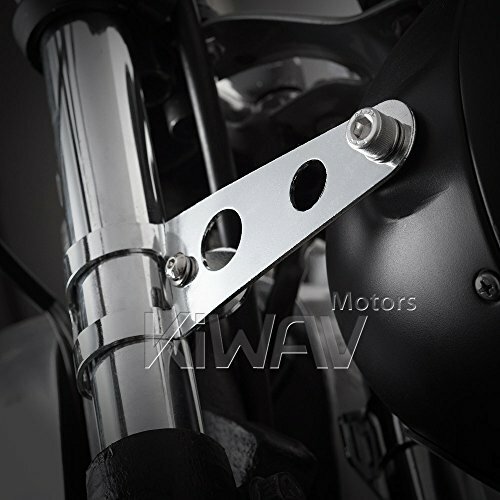 Extra holes in brackets can also be used to fit indicators/ turn signals. - 5. Can be fitted without removing your forks , simply clamp on and tighten. - 6. Ideal for custom bikes, project bikes, café racers, choppers, street fighters. - 7. Use with side-mount headlight. - 8. Easy installation. Minor modification may be required. 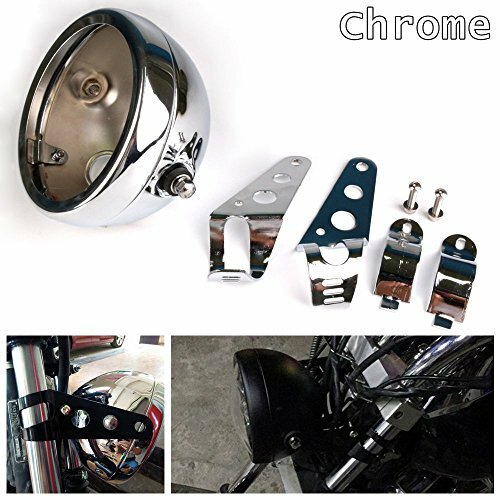 - Material: Steel - Color: Chrome - Size: *Indiator Mounting Hole Diameter: 6.9mm/ 10.5 mm (0.27"/ 0.41") *Mounting Screw Length: 18mm (0.73" *Mounting Screw diameter: 5mm - Net Weight: 215 g - Package: Headlight bracket x2, Mounting Screw x2, Rubber x2 - Fitment: Fit most custom cruiser chopper bobber or cafe racer with 30-39mm diameter fork tubes. Fits Harley, Honda, Suzuki, Yamaha, Kawasaki and BMW. ***Note: Please read the spec and compare the measurement to your own motorcycle application before placing an order. This is a custom bracket and is not intended to automatically fit the bike list without having to make some modifications. Classic Old School Styling. Perfect for that Chopper/Bobber build! 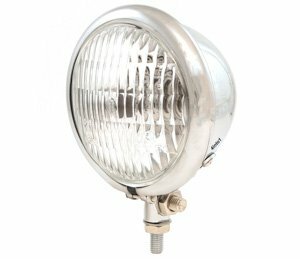 Also available with a Tri-Bar Lens Grill... Headlight: • Headlight housings are constructed of high grade steel and come chrome plated. • Glass Lens - No need to worry about THIS lens fading and turning yellow like cheap plastic knock-offs. • Super Bright 60/55W H4 Dual filament HALOGEN bulb is DOT approved and allows for HIGH and LOW BEAM operation. 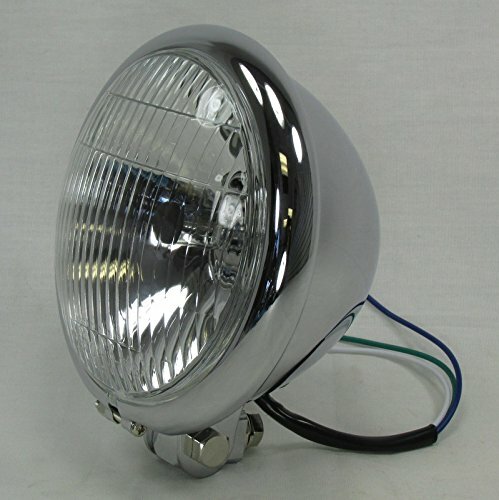 • The headlight case features a High Beam indicator light. 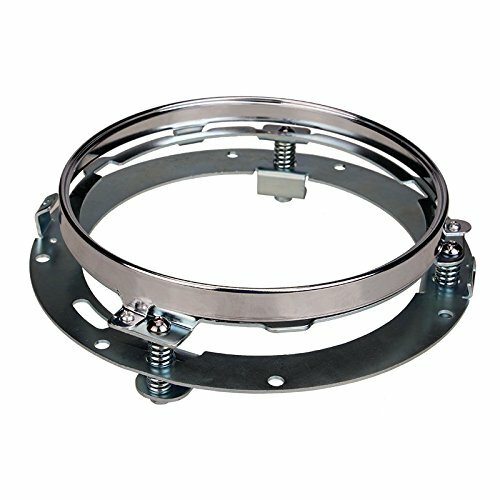 • Bottom 3/8-24 threaded mount makes for an easy install on most applications and includes all necessary hardware. • Also available with a Tri-Bar Lens Grill for $69.99 or Sold separately for $16.49. Optional Lens Grill (NOT INCLUDED): • Classic Tri-Bar design. • Lens Grills are constructed of high grade steel and come chrome plated. 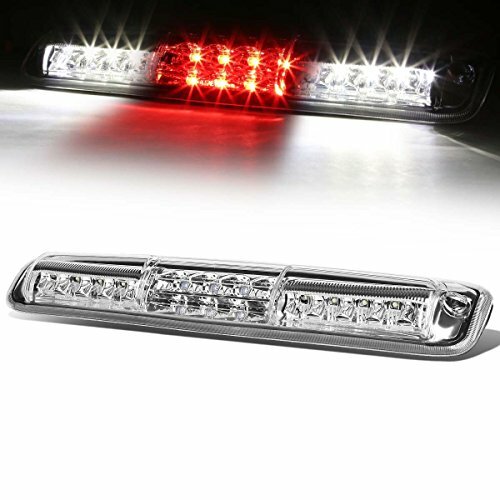 • Installs in minutes under the trim ring of our 5-3/4" round headlights. • Does NOT interfere with headlight performance. 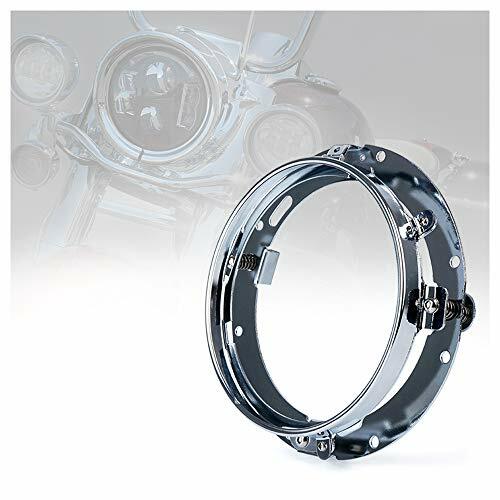 Finish: Chrome GLASS Lens Dimensions: Bezel OD - 6-1/8" Top to Bottom (W/ Mount) - 7-1/8" Depth - 4-1/2" Weight - 1 Pound 12 Ounces Mounting Stud - 1" x 3/8-24 Fitment: Any bike that accepts the above listed dimensions and mounting stud. 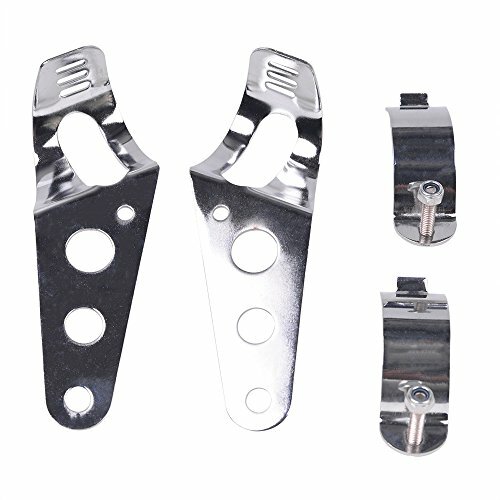 Compare prices on Chrome Headlight Mount at Shopsimal.com – use promo codes and coupons for best offers and deals. We work hard to get you amazing deals and collect all avail hot offers online and represent it in one place for the customers. Now our visitors can leverage benefits of big brands and heavy discounts available for that day and for famous brands.